A few weeks ago, my skin had the worst tantrum of life. The skincare routine that I've been using for over a year just stopped working for me all of a sudden. I was breaking out like crazy and I didn't know what to do. I'm saying even my Mario Badescu Drying Lotion wasn't helping me. 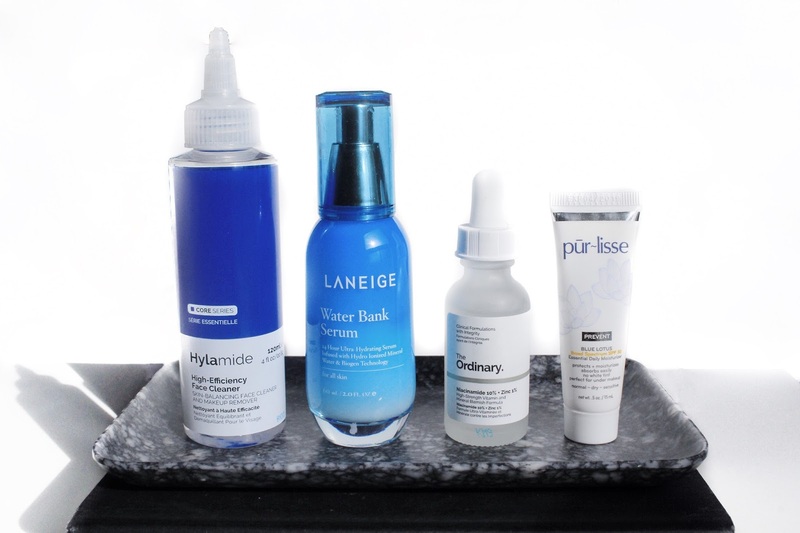 For months, I've been saying how I was going to venture into some new skincare and with this happening, I was forced to make that a priority and find a fix asap! The first thing I switched out was my moisturizer. I brought out my Laneige Water Bank Serum* again. It worked really well for me in the past, but I found that the other moisturizer I was using before this tantrum, worked even better. Now that it wasn't working for me, this one has been treating me really well. It definitely moisturized my skin and left it nice and supple. I also really enjoy the smell of it. Along side this, I was using the Pur~lisse Blue Lotus Essential Daily Moisturizer*. I received this in the BB5 September Box and thought I might as well use it. Although I could do without the scent, it did an amazing job at giving me more hydration and it has SPF 30, which I think is great. While catching up on some blogs that I follow, I came across a post on A Girl, Obsessed. She was talking about this, as she quotes, "miracle serum" that supposedly gets rid of bumps and skin congestion. Well, I've been using it for over a week already and my skin has been showing significant improvement. During my skin's b*tch fit, I was getting all these small red bumps all over. They're pretty much all gone now and I think I can thank this Serum from The Ordinary (and my new routine) to thank for that. The final thing I had to replace in my routine was the cleanser. I decided to pick up the High Efficiency Face Cleaner from Hylamide. It's sort of weird to me because it comes out looking like water, then when I massage it into my skin, it turns into sort of a milky feel and smell. Even though it's doing a great job at cleansing my face right now, I'll probably replace it in the future because I'm not that into the texture. One thing that I should note though, it does an amazing job at dissolving my makeup. I've only done that once, since I like to use micellar water before I use a cleanser, but I was thoroughly surprised with that. And that's that! Right now, my skin is getting better and better every day. These products are all working well with each other and me, so I'm happy. What do you use when your skin gets crazy?